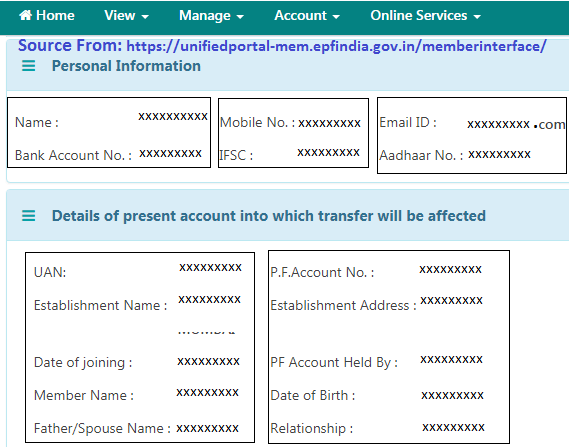 Here is the Procedure on How to Transfer Pf Amount to Bank Account or Provident Fund Amount to your Bank Account at unifiedportal-mem.epfindia.gov.in…. Exempted Category means that the employer maintains a trust. The following is a procedure for signing into the Employee Provident Fund account and transferring the Provident Fund available to the new employer’s account. This is mostly for people who regularly change jobs, and they want to move their PF claims to the new employer. We will give the simplest way to transfer pf amount to bank account (Provident Fund Amount to Bank Account). The first step is to visit the Employee Provident Fund Organization official website using this link https://unifiedportal-mem.epfindia.gov.in/. On the right-hand side of the home page, create your Universal Account Number (UAN) based login ID and sign into your account. You will be redirected to another page where you should enter your login detail that is the UAN, UAN password, mobile number, details of your current employer like the state where the employer is located, his or her establishment number and the account number. Confirm that your account is eligible to make the transfer process on the EPFO official website. Enter your employer state, and a drop-down menu will appear where you search using the name or the establishment number of your employer. Checking eligibility means you want to know if your Provident Fund account is qualified or not. If your PF account is qualified, you can now register on the EPFO official website. If not you might inquire from the EPFO to know the reasons as to why you are not eligible. You have to submit any identification documents like the PAN card, Aadhaar or a driving license. The identification documents are requested for verification purposes. A one-time password will be automatically sent to your registered mobile number from the website for verification purposes. Key in the password and press the ‘Submit’ option. After submission, you will receive another message for confirmation and be redirected to the EPFO member claims portal. To log into your portal, you will be required to provide your phone number and the document ID and press the option ‘Login’ to proceed. After signing in, you will be redirected to the home page where you can see all the option provided in the portal. Still, on the home page, select the top tab with the option ‘Request to transfer’ and click on it. The 1st part, you will be requested to enter your personal information which includes your name, email address, your salary account number and the IFSC code of the bank. In the 2nd part, the member is requested to fill all his or her relevant details of your old or previous Provident Fund account. In the 3rd part, the member will be requested to fill in all of his or her current Provident Fund account details. It is important to note that you can either use your current or previous employer to affirm your claims, which may take longer than expected to the end the whole transfer process. After you have filled all the important spaces with relevant information, you can press on the option ‘Preview’ to check and confirm that everything is okay. If not you have the option to modify until the form is ready for submission. Enter the Captcha code provided, and you will get a PIN that you will use to transfer your claims to your bank account. Press on the option ‘I Agree’ to proceed to the final step. Enter the PIN number allocated to you, and the claim transfer process will be started, and that is how one transfers their claims from their Provident Fund account to their bank account. This is how easy the EPFO members can transfer PF amount to Bank account using their Universal Account Number to their bank accounts. In case you find out that you are having issues transferring your claims, you may make inquiries to either your current or previous employer who is supposed to contact the Employee Provident Fund Organization by writing to them directly. Members should also note that they could quickly check the status of their funds’ transfer through the online portal.